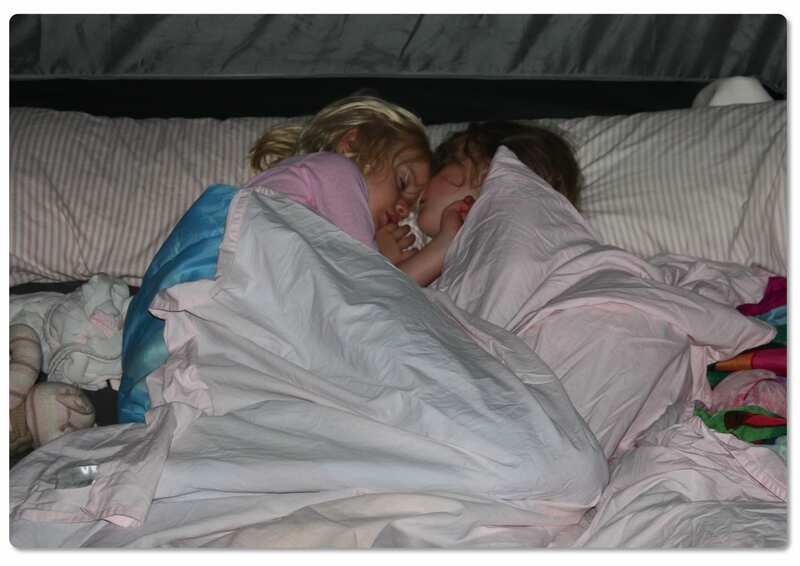 Home | Blog | It’s just so good to … camp with kids! It’s just so good to … camp with kids! We love to go camping … no really, we do! Some people think my definition of camping would be 4 Star (not sure why given I’m the least glamorous person I know) but no, I do love to get out of town and pitch the tent. 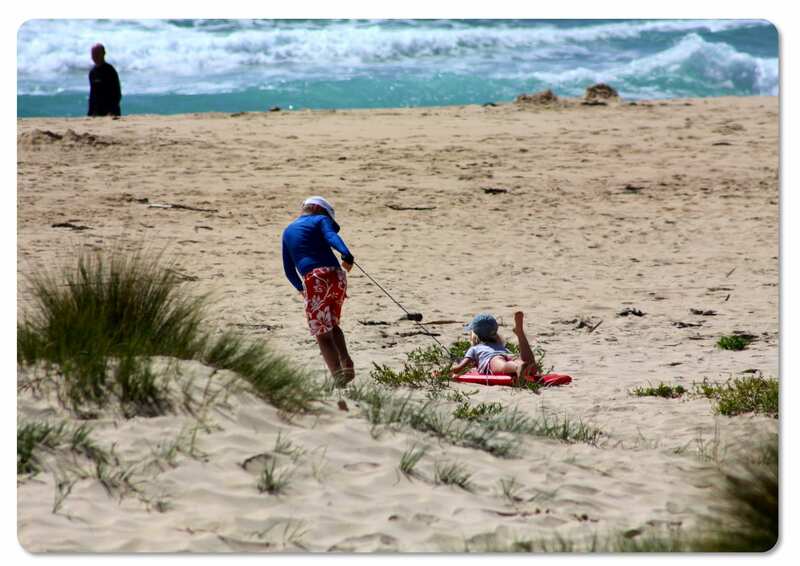 It’s a time when the whole family comes together and we all do the things we should do more – ride bikes, swim in the ocean, climb trees, fish for dinner, collect shells, walk on the beach, build sandcastles and get creative about making fun. There’s not a television in site and it’s also such a shame that there is absolutely nowhere to charge phones, iPods, the DS or anything else electronic for that matter (LOL!!) There are less fights, we all end up reading at least one book each and the kids always find a group of kids to charge around with. The last week of January this year (yes, I’ve been meaning to write this post since then), we went camping for a week with a group of friends. Everyone had children of similar ages so we ended up with a tribe of 16 kids and 10 adults. The size of the group mean there was always something for the kids to do and it was a heap of fun to see them get creative with the activities they were doing and marshmallows by the fire in the evening was an exercise in kid wrangling! Everyone loved it, in fact so much we now have a standing booking every year for the same spot. Location? Hmmm I may be shot for sharing this (those who have been visiting for years hold this spot close to their chests) but hey, you all know me by now and if there’s something I know that’s great/fun/cool/interesting, I have to share. So, we left Sydney super early and drove south for about 5 and a half hours, stopping along the way for some beautiful cheese and an early lunch in Bodalla. 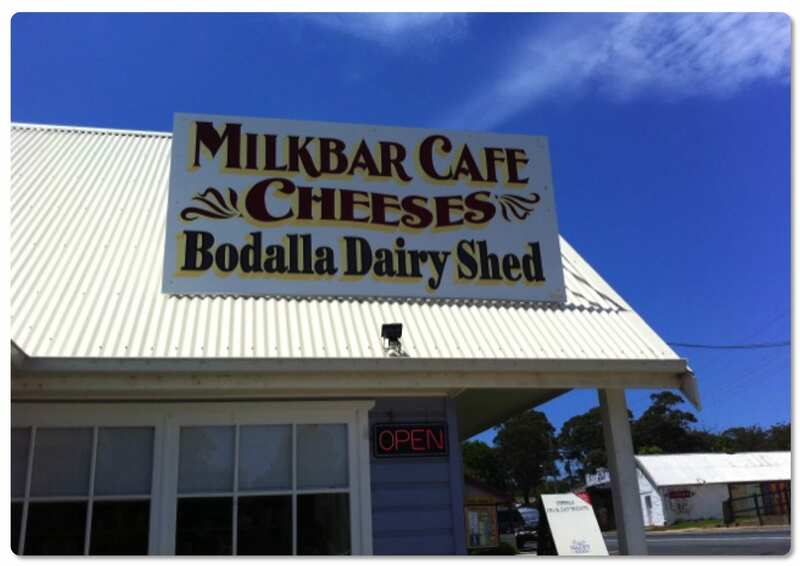 The Bodalla Dairy Shed has now become a favourite with us – we also stopped there on the way home. They have a great lunch menu and apparently Friday and Saturday nights, they cook outdoors for all the patrons and have a local aboriginal play the didgeridoo. From there you turn left at Potato Point and then head for Blackfellow’s Beach (our friends all call it Blackey’s for short). Now, I’m not quite sure when someone named a beach something so politically incorrect but I’m guessing it’s since slipped under the radar and has yet to be renamed. So if the inclusion of this name offends, please excuse. 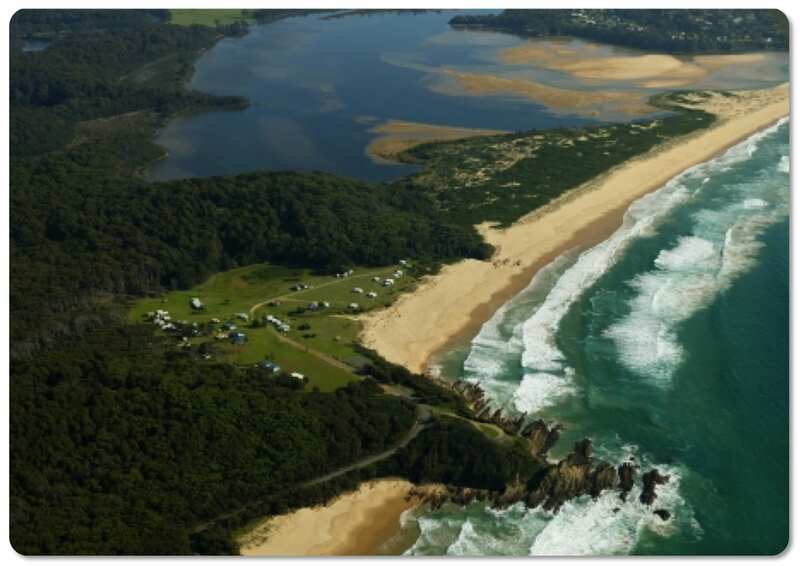 As you drive in you see the gorgeous little camping community of the Beachcomber Holiday Park nestled in against the hillside which then fronts right onto the beach. We were lucky enough to be pretty much camped just one row back from the beach (next year we’re beachfront woo hoo). From the location shot, you’ll see that we were really spoilt for choice – we could either surf on the beach straight out from our campsite, hike just over the hill and to Tuross Lake for stand up paddleboarding, fishing, kayaking or just mucking about on the edge of the lake or if Blackfellow’s Beach got a bit too rough for the kids, we’d drive 2 minutes down the road to Potato Point (a more protected beach). I should point out the fact that these beaches are unpatrolled is a downside. You have to be ever vigilant with kids near these waters. 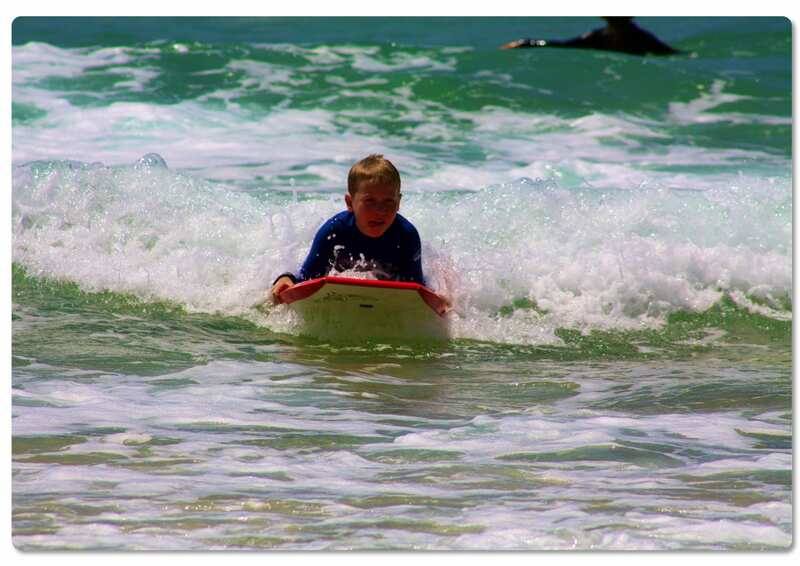 In our group however we’re well equipped with all the dads being surfers (and therefore understanding the ocean and it’s dangers) and my hubbie having been a surf lifesaver for years. It still doesn’t mean we ever relax when we’re near the water. The real relaxing starts once we’ve swum all morning and then the kids are happy to ride bikes, play cards and just explore on foot. We all chill out, kick back in our camp chairs, read a book, open the wine early and break out the cheese and crackers as we watch the waves crash and the sun start to set. 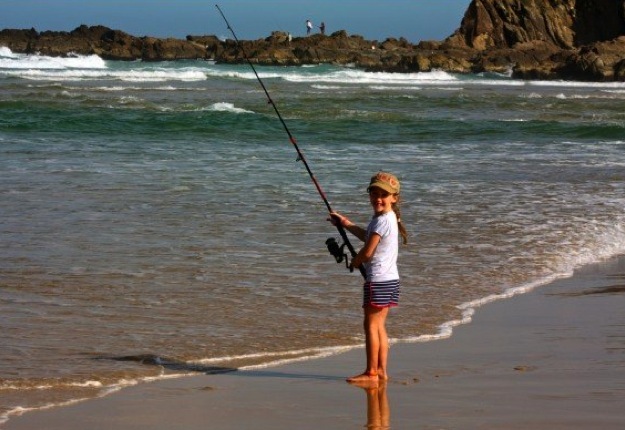 A few afternoons we took the kids down fishing – they all had a great time reeling in the catch however needed a stack of help from us baiting the hooks, casting and then of course, pulling the fish off the hooks. Such a fun time bringing in an assortment of seaweed, some tiny fish that all went back and a couple of keepers which happily made it onto the barbie. And once the kids have gone to bed, 3 or 4 of the dads will bring out their guitars for a bit of acoustic entertainment fireside. Me sing? No, no, no. I use it as an excuse to sit just beyond the shadows and curl up with a Baileys! 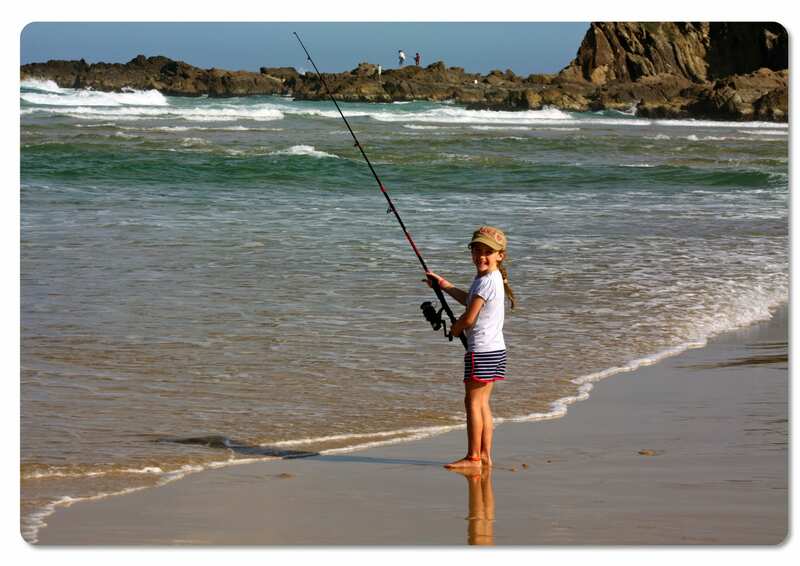 If fishing, surfing, kayaking and biking aren’t your thing – there are a stack of bushwalks that you can take – all starting from Beachcomber Resort and taking you on adventures of differing lengths. The main point being that a camping holiday always has something for everyone. And the best thing? We all come home feeling fresh, energised and decidedly outdoorsy! 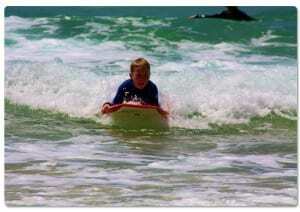 So, January 2012, Beachcomber Resort (they use the term loosely) here we come! We had to discourage sleeping like that a bit. The little one had his head across her mouth & nose so she was struggling to push him off so she could breathe. I woke both of them in the process. The older one re-settled but the younger one was upset because I had parted them. Problem was he wasn’t old enough to understand what had happened. Just as well I had to go to the toilet, then went in and checked them. A wonderful way to create great memories. I love this! I never grew up camping but my husband did. 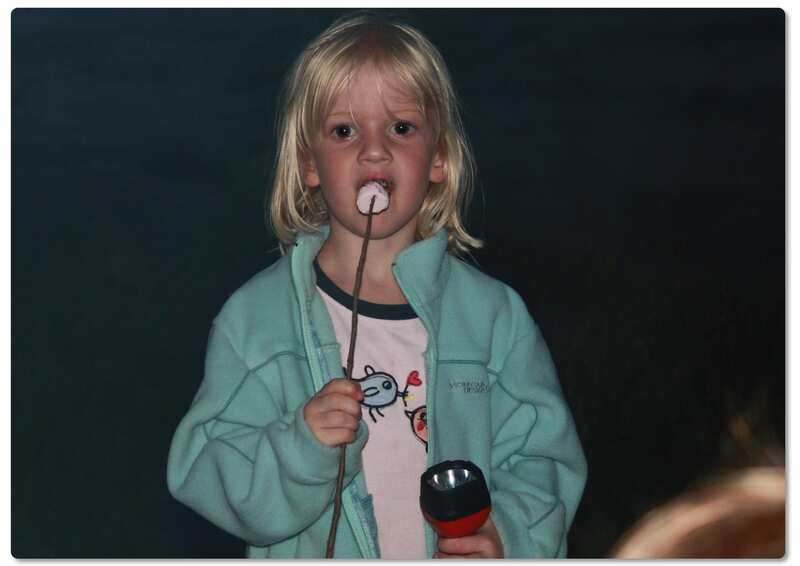 We now go camping every Easter with three extended family and as our girls get older I’m sure we’ll do a lot more. Lovely post promoting camping in the great outdoors. We used to do all those things but as the kids got older and the man too. More and more electronic devices came with us. It just wasn’t the same anymore. Thanks again for sharing; inspired to plan a trip. Thanks for sharing this article; love camping. Incredibly good for kids and families. Great for the budget too. We haven’t gone camping in years, must do this summer. We camped and caravan-ed and holidayed in cottage’d by the sea all my life. Mum and Dad loved the outdoors bush-walking and coastal walking for kilometer’s on end!! There are so many great memories like my little sister insisting on wearing her new sandles bush walking and having a bull ant bite her toe. She then wore her covered shoes and happily! We loved been scared by a goanna. It dropped out of the tree and slid down the side of our tent then tried to get into our tent in the middle of the night. Ahhh! We love that story 25 years on. We love camping, and it doesn’t have to cost a fortune. There’s so many different areas to go, especially within easy reach of Adelaide. We done the Flinders Ranges, along the Murray River, down the South-east coast, and we’ve always had fun. Mind you, I do like sites where I can have access to a hot shower, especially if we’re away on the June long week-end. Sounds like great fun and the kids are very worn out!